Everyone in the magic kingdom looks forward for the splendid summer party which takes place in the King’s royal palace every year! So, the Princess decided to put aside her royal duties for a while and have a royal spa day with her friends. She chose your princess makeover salon to get ready for the party of the year. Can you believe that? You’re the one who can help the princess win Prince Charming’s heart. Don’t let her down! The princess needs a fashion hairstyle! Wash hair with a shampoo, dry, comb tangled hair using various styling tools and cosmetics. Now choose an appropriate haircut. At your disposal is a wide selection of hair styles: long hair, short cuts, curly or straight hair. Dye your snow princess’s hair. 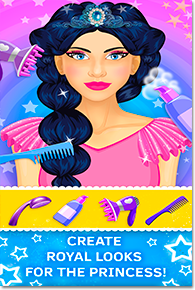 Go wild with wild colors - it's crazy makeover games! How about blue hair? Create a unique style with awesome hair accessories for various occasions. Select from a huge collection of fab tiaras, cute hair bands and cool hair clips or glamorous hats. Wow! She looks dazzling! Your princess hair do salon is the best! The princess needs a professional makeup to complete the look. Choose from tons of eye shadows, mascara, lipsticks and more! And don’t forget that glamorous accessories is a must have in this season! 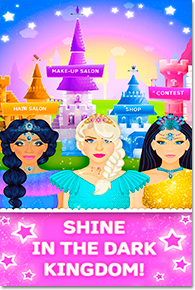 Shiny jewelry and animated tattoos will turn anyone into a beauty queen! OMG! Now she looks stunning! Compete against other princesses to win likes in social media. Vote for your extraordinary princess. Stay in the competition as long as possible. Visit the shop in the fashion game for girls 10 and up! Use likes earned in the competition to buy exclusive accessories and cosmetics for your model. 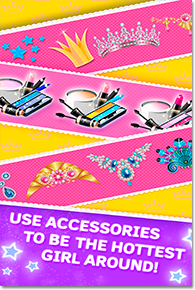 Buy looks and Pro makeup sets to be the hottest glam girl around the Far Away Kingdom! What can you do in these model makeover games? 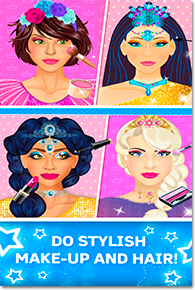 * Apply makeup in the fun makeup games for kids. There you’ll find dozens of eye shadows, lipsticks, rouge and many more! * Prove that you’re the best! Take part in the Beauty Contest and win likes for the queen-to-be.